The road to hell was paved with good intentions, and so was my road to southern Asia. Here I am on the tail end of my trip and I've only done one post. This trip has been completely exhausting and I didn't have any time to do much reflecting let alone writing until the last couple of days. Those days, however, were spent keeping myself in a mental place than enabled me to get through the adversity. Bangladesh is a whole other ball of wax, my friends. I will be spending the next many hours traveling home. From door to door it will take me 40 hours if everything goes well. I be trying to retrace my steps for you, including photos. I'm finding a lot of great info on the various places in India and Bangladesh that I will be visiting just one week from now. Here is a nice 8 min. video about Dhaka which is were I will be spending almost 4 full days (far longer than I will be in any one place for my entire 11+ days. I will post my own video and photos from my trip, but here is one that I thought did a nice job of giving me a flavor for what I'll be seeing. This will likely be my last post for at least 7 days, maybe more. Tomorrow morning I am taking my flip flops, my sarongs and my 3 favorite guys to Maui for 7 days and then Oahu for about 4 more. The room we are staying in on Maui has no TV, no phone and NO INTERNET CONNECTION. Seriously. I will have my Blackberry (did I tell you I got a Pearl, and oh, how I LOVE IT?) but it will mostly be used for keeping track of my kids and communicating with the other 4 families that are going with us. I will be taking MANY photos and upon my return will post a few and certainly link to my flickr account where you will be able to see our travels in all of their glory. One of the items on my list of things to do is to visit the Buddhist temple in Lahaina. Oh, and also to have macadamia nut pancakes at The Gazebo on Napili . We always have great grind in Hawaii. After Maui, we will venture to Oahu where we will be staying with my wonderful mother-in-law (yes, I actually LIKE MINE!). She lives in Honolulu as do her parents. So, wahines and brah's, Mahalo for visiting and I will bid you a fond Aloha until next time. 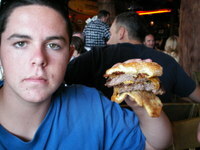 This photo is from last year's Maui trip. 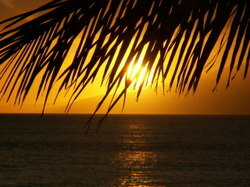 Taken by me as I watched the sun set on Napili Bay. 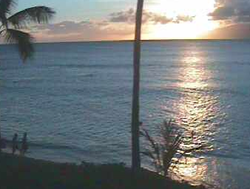 This is a shot from the live web cam on Napili Bay, Maui. It is where I will be 3 days from right this very minute. Mai Tai in hand, loving husband and 2 wonderful man-children at my side. We will be laughing and feeling the sand beneath our toes. And I won't even be thinking about work, blogging or anything other than the fabulous life I have and the fortune that I am experiencing right at that moment. I just ready a very funny (but discouraging and disturbing) account of one man's recent flight experiences. This just 4 days before I get herded onto a flying mass of steel (is that what they are made out of? Dunno, really) hoping that I don't catch whatever Jr. sitting behind me has as he sneezes and coughs. Or that I don't get stuck next to the guy that hasn't showered in a month, or whose hair is so greasy that it leaves a stain on the seat-back. Don't get me wrong. I actually love flying. I actually find it entertaining to sit and listen and watch and try to figure out why people do what they do. But actually getting a flight to take off on time, and getting your bags to come with you, and then lucking out with a decently groomed seat-mate is really all just dumb luck. Read this poor man's story. You'll consider yourself lucky the next time you take a trip. At least, I hope I still will feel that way after my flight on Friday. This is where I'll be in 6 days. Napili Bay, Maui. This photo was from last year's trip. This year I will be traveling with my FAB family of boys (Dan, Payton and Darren) and we will be meeting up with 4 other families from San Carlos. 10 boys in all between the ages of 8 and 17 and a couple of girls thrown in for good measure. It will be crazy fun. For now, I'm gearing up with my Hawaiian music, flip flops and sarongs. Yes, folks...I'm really already there. For now, my body will stay in San Carlos, but my mind, heart and soul are in the land of Aloha. 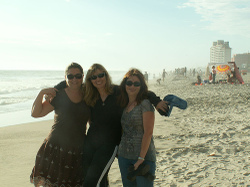 Me, Becka and Katie...Deidra is taking the photo. This was our first evening, taking a walk on the beach. 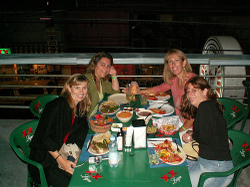 Eating lobster in Puerto Nuevo. We closed the place down on a Saturday night...don't call us old! 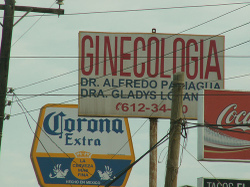 Some of the signs just cracked me up! The kids are in Disneyland with my Mom for the weekend, and since Friday was our 16th anniversary, hubby and I decided to take a day trip to Napa. We had only ever been up that way once together, but it was for a soccer tournament, so that doesn't count. It was cool and cloudy this weekend in the Bay Area; a perfect start to the fall. I love this time of year. I like seeing the changes in the foliage (even though we don't REALLY get fall color out here much) and in the clothes people wear. It is a cozy time of year without being uncomfortable in any way. It is also crush time in the Napa Valley. Many of the grapes are being harvested and then crushed. It is hustle and bustle in an otherwise quiet, sleepy region. 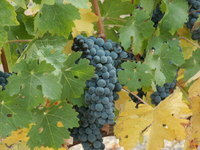 The merlot grapes were still on the vines (pictured here) which provided for many wonderful photo ops. 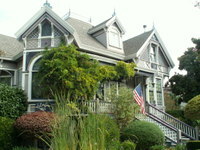 We started by visiting Dan's former boss Steve, who owns La Belle Epoque B&B in Napa. We got a nice tour, including the kitchen. They had just finished serving breakfast and you could smell how wonderful it must have been. Apparently they serve white chocolate raspberry scones, homemade of course, along with cheese frittata, smoked bacon and other sumptuous delights by candlelight each morning. Steve also set us up with the maps and info we would need for a beautiful day of wine tasting and touring of the valley. 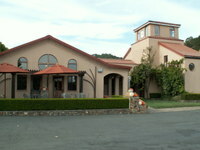 The first winery we visited was Ballentine Vineyards. It is a small place, nothing fancy, but the wine was wonderful. Our tasting began with the 2005 Chenin Blanc which was very light and easy. Then we tried the 2001 Zinfandel, the 2004 Zinfandel Block 11, the 2001 Merlot and the 2001 Integrity. There was a guy there with us who clearly knew what he was doing. He actually spit out the wine after he had tasted it...I get why you do that, but what a waste! He was actually interested in knowing exactly where the vineyards were located for each of the varieties. He was very nice, but clearly an expert. He was also alone. 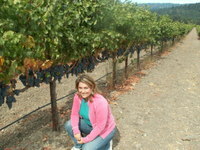 I'm pictured here next to the merlot vines at Ballentine. After some shopping in St. Helena, we were off to the place where my favorite wine is made. Rombauer Chardonnay, although it is not typical of the kind of Chard. I like, is (so far) my favorite. This winery is tucked up on a hill off of the Silverado Trail and was the most beautiful place we saw that day. We started with a tasting that included, of course, the Chardonnay, the 2002 Cab, and the 2003 Zinfandel. The real surprise, and Dan's favorite of the day, was the desert wine called Joy, Late Harvest Chardonnay. It was the kind of wine that you would only need to have a few sips to enjoy, otherwise it would be too much, too sweet. It was beautiful. If it weren't $55 a bottle (and I hadn't already spent $38 on a bottle of Chard., we would have walked away with one. The name recognizes the "Joy of Cooking" cookbook which was originally written by Irma Rombauer which was evident by all of the cookbooks for sale in the tasting room. 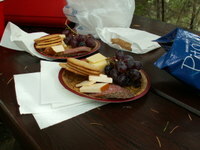 My thoughful hubby had packed a picnic lunch in case we found a great spot for some between tasting refreshments. Rombauer grounds were perfect for this. We ate on a picnic table nestled within the trees and gardens. Pepper Salame, smoked gouda and jarlesburg cheese, grapes, strawberries, spicey hummus, pita chips, and peanut butter and chocolate bites on the menu. I have to say this picnic was such a breath of fresh air. Anyone who has spent the last 15 years of their lives raising children and then has a day like this, a meal like this, in a setting like this, with a man like this, would be in heaven. We laughed, ate, and soaked in the time together. Off we went to our last stop of the day, the Steltzner Vineyard. Here we had the nicest actual tasting experience. The person who was pouring was friendly and knowledgeable and actually took the time to teach us HOW to taste. Again, this was a pretty small place (pictured here). We were the only ones in there for quite a while, which was great for beginners. We started with a 2003 Sauvignon Blanc that was fabulous! Eventually other folks came in for testing and 3 other people said "I'm not usually a Sauvignon Blanc fan, but this is incredible!" We agreed, and bought a bottle. We tasted the rest of the flight and also enjoyed the 2004 Cabernet Franc. It was the only red wine we had tried that day that jumped out at us newbies as really delicious and so we bought that as well. A day trip to remember (and to be repeated!). My bag on my palm, originally uploaded by KRob2005. 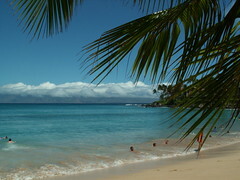 This photo was taken on Napili Bay about 30 steps from our room. The bag is my beach bag and this palm is the tree that Dan and I planted ourselves under for 3 days. 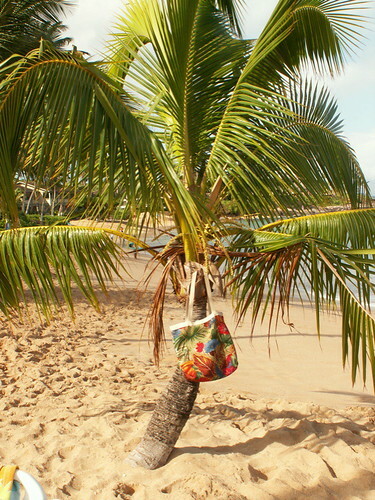 The bag was hung in the tree because every once in a while a wave would come all the way up the to tree. Those are the kinds of problems you have in paradise. I bought some pineapple salsa today, and I've had a couple of Mai Tai's since I've been back. I've also only worn something other than flip flops to work twice since I've been back. I resent every day that I have to put pants on instead of a pair of board shorts or a beach wrap. I feel like if I don't get some 85 degree weather soon, I'll perish. On our last day in Maui we came across this sign on Front Street in Lahaina. I started yelling "Pull Over! Pull Over!" and thank god I didn't scare Dan too much. As he pulled over to indulge his photo crazy wife, I noticed that we were in fact, not the only ones who had pulled over to take a photo of this sign. Mission accomplished. We decided on this trip that we like Maui...a LOT. We also decided that we don't like Honolulu very much. We visited Kailua for the first time. Ate lunch as Buzz's by the beach. When I get my non-digital photos developed, I'll share more photos including the photo my son took of the spot where Bill and Hillary at at Buzz's! 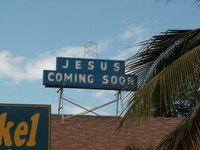 I am embarassed to say that my 15 year old son spoted the humor in this sign well before I did. He made us stop so he could take a photo of it with his phone and he promptly sent it to all of his friends. We had a pretty good laugh at it and my 13 year old asked the $64,000 question, "Who would name their kid Mary Jane if their last name was Stoner?" Indeed. Of course I realize that there are other ways that she could have ended up with that name...but then where is the fun in that? Our travels are done for now. I realize that I did hardly any blogging about BlogHer and I'm regretting it. 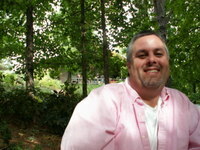 I think I was so pre-occupied with the trip coming up that I wasn't as engaged in BlogHer as I would like to have been. I've been having a blast reading posts by Badgerbag, Grace, SocalMom, Christine, Left Coast Mom and others. I really missed participating in day 2. Too many things to do, too little time. Just a quick post as I am trying to limit my on-line time here in the beautiful state of Hawaii. We are on day 3+ and still have 6 to go. 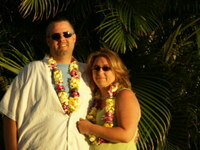 We spent 2 nights at the Outrigger Waikiki on the Beach. Expensive but worth it. Nothing like having beach access in less than 2 minutes. We did some tanning, swimming, eating, shopping. Here are a couple of photos, but my flickr account has them all. It poured overnight last night. We are hoping to get out to a beach today, but if the swells on the windward side are too dangerous, we may have to go to plan B, only we don't have a plan B. Off to Maui tomorrow without the kids (they are staying with Grandma). I must say, that will be quite nice. 2 fewer people to have to please with food/activity choices. They will join us on Friday when we will go on a snorkel cruise to a crater off of the Maui coast. The kids are finding it hard to be so dis-connected from their friends. They are getting a little bit of time to IM and stuff, but not nearly as much as they are used to. They are truely social beings. Until later, Aloha and Mahalo for stopping by.